Casts away gloom, depression …as it relieves headache pain fast! Depression often intensifies headache pain. So don’t settle for old-fashioned aspirin which has no special ingredient to relieve depression. Take today’s AnacinÂ®. Anacin doesn’t dull the senses or leave you depressed. 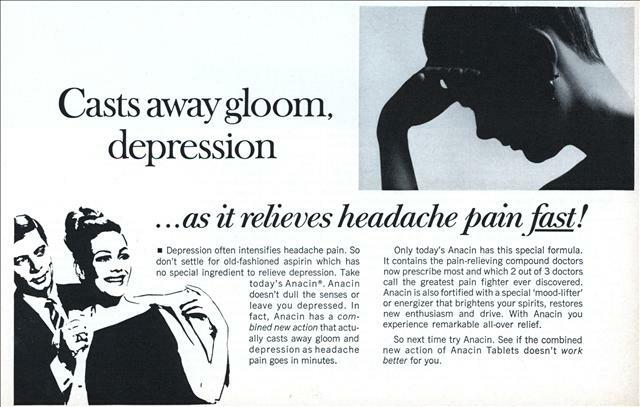 In fact, Anacin has a combined new action that actually casts away gloom and depression as headache pain goes in minutes. Only today’s Anacin has this special formula. It contains the pain-relieving compound doctors now prescribe most and which 2 out of 3 doctors call the greatest pain fighter ever discovered. Anacin is also fortified with a special ‘mood-lifter’ or energizer that brightens your spirits, restores new enthusiasm and drive. With Anacin you experience remarkable all-over relief. So next time try Anacin. See if the combined new action of Anacin Tablets doesn’t work better for you. Probably the caffeine they add to a lot of aspirins. Each anacin tablet contains 32mg of caffine. Caffine is a common ingredient in many over the counter pain relievers. Asprin by itself has a tendency to make some people (like me) drowsy. It’s caffeine. Anacin, if I recall correctly, was aspirin and caffeine. Caffeine relieves some types of headaches and “casts away depression” (if you use a somewhat vague definition of depression).